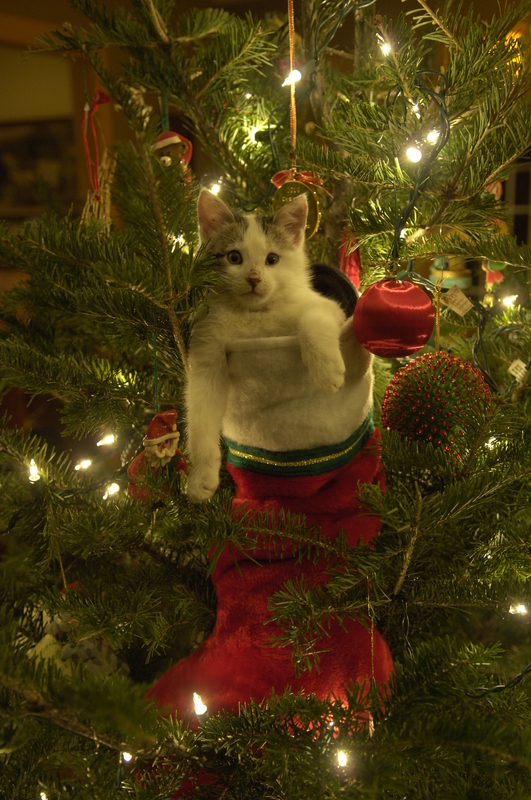 12/5/05–Alexandria, VA–Little Cajun in the Christmas tree. Holiday celebrations may be what many humans look forward to all year long, but they’re not always a treat for our beloved pets. Fortunately, there are many simple and even fun ways we can help our animals enjoy the holidays safely and less stressfully. After many media warnings, most pet lovers know that some seasonal decorations are unsafe for pets. Tinsel, ribbons, and glass ornaments on a Christmas tree may look lovely, but other types of garlands or decorations are safer for cats and dogs. Pine needles also need to be swept up and tree water kept clean and covered. Certain holiday houseplants are poisonous to pets, yet some say they can be inside your home safely if you plan ahead: Poinsettias can be placed up high in an inaccessible spot or a tall bookcase, and mistletoe can be hung way out of reach of even the most acrobatic cat. Alternatively, try decorating with plants like Christmas cactus, which are non-toxic, or hanging artificial mistletoe that looks real. Holiday lights and electric decorations often attract our pets. Be careful to secure strings of lights and other electrical fixtures out of reach, to check that they are not frayed or damaged, and to make sure batteries are dry and switches are installed properly. Make sure your pets can navigate around your light displays safely, or put lights in rooms or outside where only humans can visit. Because we all love our pets (and most of us love to eat), making or buying holiday treats for our pets is part of the joy of the season for many of us. Most foods intended for people, and many spices and seasonings, need to be off limits to our animals. Yes, cats do tend to want fish and dogs love pumpkin and peanut butter, however, chocolate, onions and chives, garlic in more than small amounts, grapes or raisins, macadamias and high-fat nuts, other fatty foods, heavily salted, sugared, or spiced dishes, raw meat or raw eggs, chicken bones, and coffee can be dangerous for them and for other pets. And of course, alcohol, tobacco products, caffeinated drinks, and any prescription or recreational drugs should be kept out of their reach. Just having safe, healthy treats on hand will make it easier for you to help your pets avoid eating “no-no’s”. If your pet would enjoy a new toy or bed, think outside of the box or…just use one: a shipping box from holiday gifts (with towels) often becomes a dog or cat’s favorite bed. Crumpled paper (thrown away as needed!) or a tennis ball is all you need for a game of catch or floor hockey. Buying or making a climbing tree or scratching post for cats or a chew or pull toy for dogs are always great options. But being with you is what your pets want, so making time to play or just snuggle is still the best gift you could give them. Most animals don’t like change much unless it involves more treats. Help your pets navigate the changes in your household that holidays bring by allowing them some safe, quiet, “normal” places and routines at home that are not part of the holiday hubbub. If your cats are used to their quiet place or your dogs like to be walked at the same times every day, keeping routines and home spaces just for them will help make the holidays more peaceful. (And why not enjoy some extra walks with the dogs, or playtime with all of your animals?) Extra attention from you, including smushes, grooming, or playing, will make this time of year even better for your pets. Your holiday guests will have their own daily routines and their preferences for food and prescriptions, as well as alcohol, nicotine, or other drug use. Talk with visitors about your pet’s needs, and introduce new folks to your animals with mutual respect and care. This includes petsitters or boarding personnel if you’re traveling solo. Instructions you share about your pet’s care would include information about diet, toys, any prescription food or medicine, daily routines and preferences, veterinary history, and emergency contact information for you and your pet’s vet. If you’re traveling with your pet, consult with your vet a few days before you travel, in case your pet needs to have special precautions taken. Many New Year’s resolutions sound familiar and involve pets: “This year we’ll get a dog.” “Let’s get the kids a cat.” Although adopting an animal is one of the biggest responsibilities people can take on and one of the greatest joys anyone can know, it’s one we just can’t foist on others. Please don’t give an animal as a gift. Shelters and rescues report that animals given as unsolicited and sometimes even requested gifts often end up abandoned. Instead of giving an animal to people you love, why not invite them to visit a local shelter or rescue with you to meet potential pets or just visit beautiful critters? If your family or friends are interested in particular breeds, a Google search will find many breed-specific rescues that help with adoptions—a much more humane and less expensive alternative to buying a rare, purebred, or exotic pet. Many animal rescues with limited facilities also need foster families. Help your loved ones plan their own adoption or fostering of a cat, dog, or other pet in 2019 (see Resources at the end of this column). Consider donating food, toys, supplies, or your time to a rescue in the name of your loved ones, human or animal….and enjoy the holidays! Steph volunteers with King Street Cats and lives in Alexandria with her husband and their two kitties Dorian and Callie, who were adopted from city neighborhoods in Delaware and Virginia.